Wildlife refuges protect habitat for so many creatures! Bird life is abundant on the Santa Ana National Wildlife Refuge in southern Texas. This large stretch of Tamaulipan brushland was preserved for its wildlife, including many species found nowhere else in the United States. 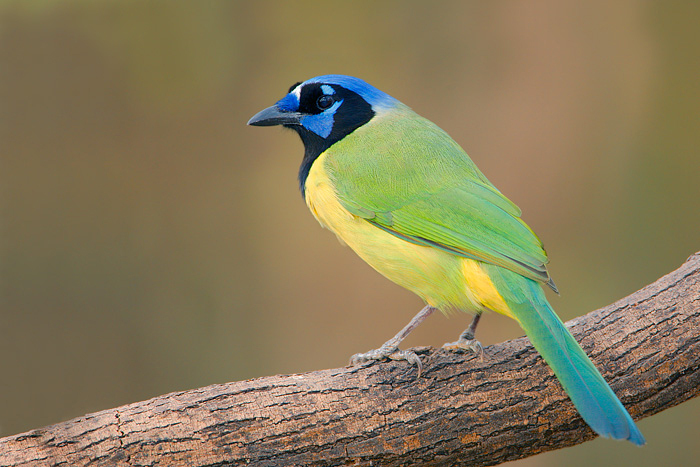 One of the special birds on this refuge is the Green Jay. These jays and other birds persist in Texas because of active conservation of habitat along the Rio Grande. A series of refuges there -- Santa Ana, the World Birding Center, and others -- provides a wildlife corridor that allows birds and other animals to move up and down the river, assuring their survival in the midst of farmland. [Calls of Plain Chachalacas] A Plain Chachalaca… [Call of a Great Kiskadees] a Great Kiskadee… [Call of Green Jay] a Green Jay… it’s morning along the Rio Grande in South Texas. Bird life is abundant on the two-thousand-acre Santa Ana National Wildlife Refuge*. This large stretch of Tamaulipan Brushland was preserved for its wildlife, including many species found nowhere else in the United States. One of the special birds on this refuge is the Green Jay. It’s a gaudy tropical species that never fails to astonish anyone who sees it for the first time. As green as a parrot, with a black and blue head and yellow tail, the jay has an exotic voice to match. These jays and other birds persist in Texas because of active conservation of habitat along the Rio Grande. A series of refuges provides a wildlife corridor that allows birds and other animals to move up and down the river, assuring their survival in the midst of farmland. Sounds of the birds provided by The Macaulay Library of Natural Sounds at the Cornell Lab of Ornithology, Ithaca, New York. Calls of Plain Chachalaca 130903 recorded by G.Vyn; call of Great Kiskadee individual 10553 and two birds 105571 by G.A. Keller; calls of Green Jay 69970 by P. Schwartz and 120972 A. Hennessey. Ambient drawn from 105549 Green Jay track by G.A. Keller recorded at Santa Ana NWR. [*a former Mexican land grant that barely escaped being part of a river development project].